BERTRAND, born in Autun, he studied under St. Germanus of Paris (28th May) who priested him. St. Bertrand served as Archdeacon of Paris, and was consecrated Bishop of Le Mans in 587. While Bishop, St. Bertrand founded a monastery and hospice in his See, known for his keen interest in agriculture and viniculture, producing a well-respected wine. St. Bertrand reposed 623. CLOTSINDIS (CLOTSEND), a daughter of SS. Adalbald (2nd February) and Rictrudis (12th May), St. Clotsindis received monastic tonsure at the abbey founded by her mother and later known as the Abbey of St. Rictrude and St. Peter of Marchiennes on the Scarpe River in present-day Hauts-de-France. 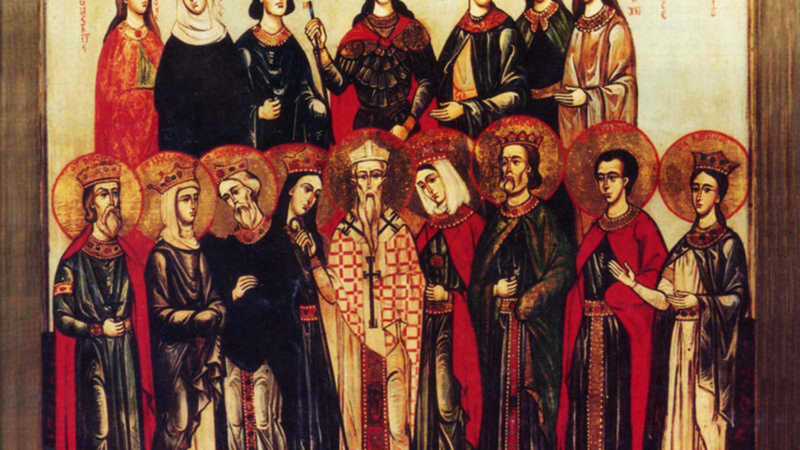 Following the repose of St. Rictrudis in 688, St. Clotsindis became Abbess. St. Clotsindis reposed in 714. EMILIANA, (Date Unknown), a virgin-martyr in Rome of whom nothing further is known. ERENTRUDE (ERENTRUDIS), a sister, or possibly niece, of St. Rupert (27th March), Apostle of Austria. St. Erentrude was the first Abbess of Nonnberg in Salzburg, which was founded for her by St. Rupert. St. Ermentrude reposed circa 718. EURGAIN, (Sixth Century), St. Eurgain was the daughter of a Welsh chieftain and foundress of Cor-Eurgain, later known as Llantwit, in the Vale of Glamorgan, Wales. GAIUS and LEO, (Date Unknown), SS. Gaius, a priest, and Leo a subdeacon, martyrs whose names have appeared in martyrologies since time immemorial. Unfortunately no further information of their lives, including date and place of their martyrdom is extant. LUCINA, (Date Unknown), a Roman matron who was inspirited to convert by the example the Apostles. Following her baptism, St. Lucina devoted her time and wealth to the work of the Church, visiting imprisoned Christians, and providing burials for martyrs, including, it is said, SS. Processus and Martinian (2nd July). St. Lucina flourished during the reign of Nero (r. 54-68), more exact dates are unknown. MARCIAN, a Bishop of Pampeluna (present-day Archdiocese of Pamplona y Tudela, Spain). Sources place the date of St. Marcian’s repose as circa 757, and then state he was in attendance at the sixth Council of Toledo which was held in 638. At this point I have not been able to locate information that reconciles this obvious discrepancy. MARTIAL of LIMOGES, ALPINIAN, and AUSTRICLINIAN, Martial, the first Bishop of Limoges, and Apostle of the Limousin, together with two of his priests. There is practically nothing in the way of reliable information extant about these Saints. The year of their repose is generally believed to be circa 250. OSTIANUS, (Date Unknown), a saint, generally said to have been a missionary priest in the area of Viviers in France. No authoritative information on his life is extant. PROTOMARTYRS of ROME, an unknown number of Apostolic Era Christians, who, having been charged by Nero (r. 54-68) with burning down Rome in 64, were martyred in a variety of horrifically barbaric ways.